TECUN UMAN, Guatemala (Reuters) - Hundreds of members of a caravan of migrants who had crossed Guatemala tried to breach the Mexican border on Friday, as the Mexican government vowed to tackle the convoy that U.S. President Donald Trump says must be stopped before it reaches the United States. 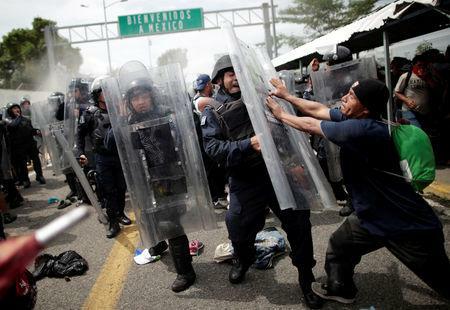 Central American migrants pushed through Guatemalan border posts and streamed onto a bridge connecting the two countries, only to be halted by dozens of Mexican police dressed in riot gear on the other side, Mexican television footage showed. Some migrants violently shook fences at the border, the footage showed. A handful jumped into the Suchiate river below to swim for rafts. Others turned back toward Guatemala. 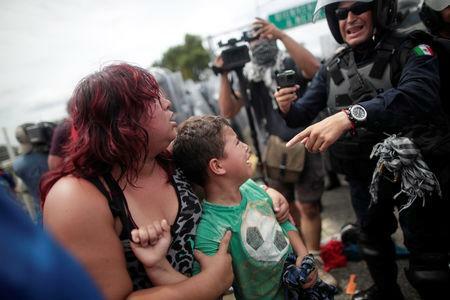 Carrying backpacks and small children, many bedraggled migrants simply sat down on the bridge. Some said that they had been teargassed. Jose Brian Guerrero, a 24-year-old Honduran traveling with neighbors and his extended family, said he had joined the caravan to escape violent street gangs, and to find work in the north. 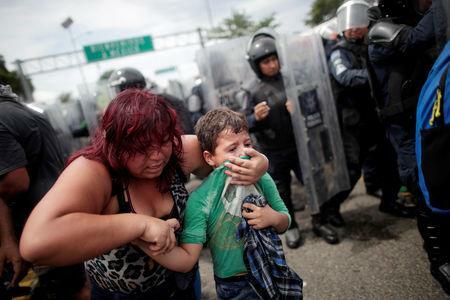 Honduras, El Salvador and Guatemala are among the poorest and most violent countries in the Americas. Their emigrants make up the bulk of people now caught trying to enter the United States illegally every year. Earlier, Mexican Foreign Minister Luis Videgaray and U.S. Secretary of State Mike Pompeo met in Mexico City and discussed the caravan, which left Honduras last weekend. In contrast to the earlier caravan, which was deep into Mexico before officials began intensive efforts to process the migrants, the Mexican government turned its attention on the new group right on its southern border. The government has sought assistance from the United Nations High Commissioner for Refugees (UNHCR) to help process migrants claiming refugee status, which could allow it to disperse them.